Leiden Special Collections Blog - Articles - Fashion, or a matter of economics? In the UBL, the rare printed books are more or less stored according to subject. This makes it possible to survey shelves that contain comparable titles. I did so for cupboard 1196, in which many versions of the Psalms of David are kept, printed in the Netherlands and mainly dating to the seventeenth century. The Psalms, a type of book used in all levels of society, were printed in relatively large numbers. 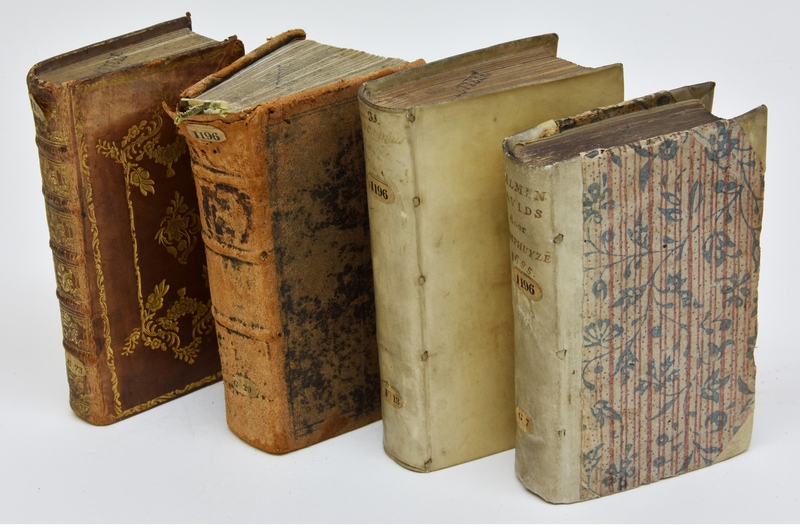 If the buyer wished to personalise his or her purchase, the book would be bound on commission, but book sellers also kept specimens in store, already bound and ready for use; these titles sold well and the risk of the investment was low. It is not remarkable therefore, that when we look at the physical appearance of these Psalms, we can identify a few categories. Some of the books are bound in full leather, some are bound in full parchment and others are covered in half parchment (that is: spine and corners) combined with decorated paper, covering the boards. The latter group catches the eye, and not only because the papers used are very pretty. This covering scheme is quite unusual for the period, and we will explore them further below. The full leather bindings can be divided in two groups. The first group consists of richly decorated leather bindings, or more sober bindings but with textblocks of which the edges are gilded and tooled in a decorative pattern. These objects are clearly individually commissioned books and their owners paid for their personal choice of materials and luxuriousness. The second group contains almost plain leather bindings, not always of the best quality and with minimal tooling, if any; these items were the ready bound books, offered as an alternative for the parchment bindings. The parchment bindings are all of the laced-case type; the textblocks are sewn on parchment strips and the outer ends of these strips are laced through the parchment cover in the joints. This type of binding structure was extremely common in the Low Countries throughout the sixteenth to eighteenth century. However, the use of decorated paper – in this case mainly block-printed papers and a few instances of marbled papers – is not so common. It seems we are dealing with two groups of bindings. How should we rank them, were the decorated papers fashionable and therefore did they cover the more expensive items? An interesting detail allows us to answer that question and draw some conclusions. All full parchment bindings (23 in cupboard 1196) have an additional method of board attachment (apart from the lacing of the sewing supports): endbands were sewn at the outer ends of the textblock spine and the slips of the parchment endband core were also laced through the parchment cover. Thus, the endbands have a structural function as they connect textblock and binding at head and tail. All half parchment bindings (14 items) lack this additional connection between textblock and binding. None of them was provided with endbands, and therefore the construction of these books is less durable. The deliberate, and consistent omission of endbands on the books covered with the decorative papers points at an economic motivation. It is clear that the making of an endband involved additional time and materials, as would the application of the slips of the endband core as a functional binding component. Omitting the endbands saved labour and expenses, and the books would be cheaper because of it. We must assume, then, that the decorated papers were also lower in price range than parchment was. By using this paper to cover the boards, it was possible to economise a little further while it was still possible to produce an attractive book that would sell. Left: UBL 1196 F 23 and 1196 F 12, the laced endband cores at the head and tail of the full parchment binding are marked. Right: UBL 1196 G 3, a half parchment binding without an endband, and 1196 F 13, a full parchment binding with an endband. Unfortunately, the papers cannot be used to further group the volumes. 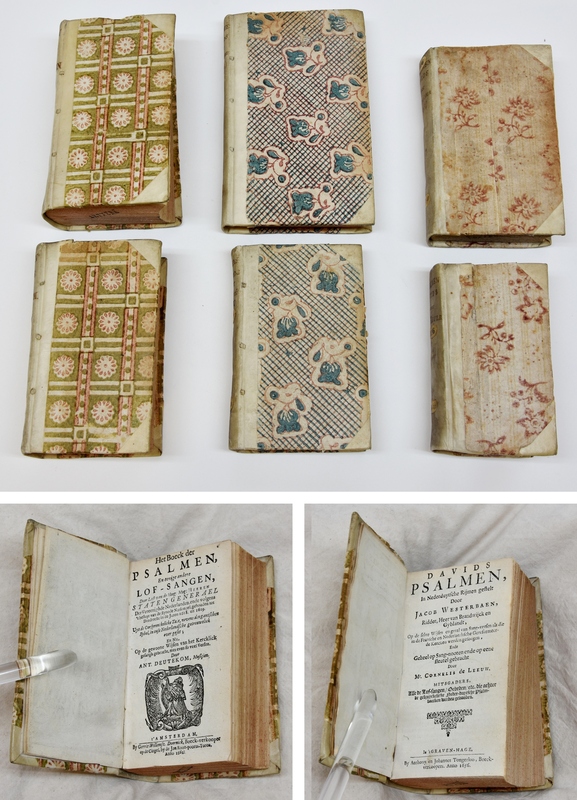 Though three sets of identical block-printed patterns can be found, they are applied to books with divergent bibliographical data (for example UBL 1196 G 5, Davids Psalmen, ‘s Graven-hage, 1656 and UBL 1196 G 10, Het boeck der Psalmen, Amsterdam, 1662, or, even farther apart, UBL 1196 G 11, De CL Psalmen, Leyden, 1649 and UBL 1196 H 33, Basuin-Klank, vervatende eenige uitgelesen Psalmen Davids, Groningen, 1664). Though there are several reference works on decorated papers, an in-depth study into the production, distribution and usage of this kind of block-printed papers remains a desideratum.